In August of 2018, I herniated a disk in my back preparing for an impending storm. The pain was excruciating. When I called OSC, I had no idea what to expect because I had been cared for through the Military system for 30 years. From the moment I spoke to the folks at OSC, I knew I was in good hands. Dr. Jeffrey Carlson and the staff there knew I was in serious pain and they all showed such great compassion for me. 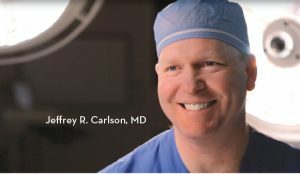 Dr. Carlson’s staff helped with pain management until there was a final diagnosis and treatment. Dr. Carlson expedited my MRI on-site…less than 48 hours later. Shortly after that, we met and he told me it required surgical repair. Eleven days later, he performed a “diskectomy” on me, and the relief was immediate. Things went so well, I returned to work seven days later and haven’t looked back. I cannot thank Dr. Carlson and the caring staff at OSC enough for taking care of me. His skill as a Surgeon, and his staffs’ professionalism and compassion made the difference in my quality of life and I cannot thank them enough.